..... Click the link for more information. , the mother of Hasan and Husein, and reputedly the ancestress of the Fatimids. She is revered by all branches of the Islamic faith and is the subject of many mysteries and legends. (fä`tēmə), hamlet, W central Portugal, in Beira Litoral. At the nearby Cova da Iria is the national shrine of Our Lady of the Rosary of Fátima. This became a great Roman Catholic center of pilgrimage after the six reported apparitions of the Virgin Mary to three shepherd children, May 13–Oct. 13, 1917. An impressive basilica was begun in 1928 and consecrated in 1953, and the Church of the Holy Trinity, one of the largest churches in the world, was consecrated in 2007. Two of the children, siblings Francisco Marto (1908–19) and Jacinta Marto (1910–20), were canonized in 2017 by Pope Francis; their cousin Lúcia de Jesus dos Santos (1907–2005) ultimately became a Carmelite nun. Pope John Paul II visits Lucia Dos Santos in 1991. She was a Carmelite nun who was the last survivor of three children who saw visions of an angel and of the Virgin Mary in 1916 and 1917. AFP/Getty Images. In 1917 Fatima, Portugal, was the site of what became the most heralded apparition of the Virgin Mary in the twentieth century. The apparitions were initiated in 1916 by several visits by an angel to three shepherd children, Lucia Dos Santos, Francisco Marto, and Jacinta Marto. The children—aged nine, eight, and six, respectively—were illiterate at the time. About a year after the angel’s visits, on May 13, 1917, the children saw what they described as a beautiful young lady dressed in white and shining with light who appeared to them. At this initial encounter, she asked them if they wished to accept their calling, which would entail their suffering in reparation for the sin of people with the aim to convert them. They answered in the affirmative. She then told them to come to the same spot on the thirteenth of every month. At the October apparition, she would reveal her name and purpose. The lady appeared twice, on June and July 13, and a crowd attended both visitations, word having spread far and wide of the children’s claims. Hostility also grew against the children, and in August the local magistrate, a Freethinker, imprisoned the children so they could not attend. Some 18,000 people showed up at the spot of the promised apparition in their place. The virgin appeared to the children privately after their release. The crucial events occurred on September and October 13. Some 30,000 joined the three children in September. Around noon the sky darkened, then a globe of light appeared in the eastand headed toward a tree that had been the focal point of the apparitions. Some white flakes began to fall from the sky. The Lady, seen only by the children, said she would work a miracle on her last visit. The light receded into the eastern sky. The crowd that gathered on the last day numbered between 70,000 and 100,000. It was a cloudy, rainy day. The Lady appeared to the children and delivered her message, then the children saw a ray of light go up from her to where the sun would have been in the sky. Lucia called for the crowd to look at the sun. As she spoke, the clouds parted and a bright, silver disk appeared in the sky. Everyone, believer and skeptic alike, saw it begin to twirl. The twirling sun shooting out lights was visible to people up to thirty miles away. After about half an hour, the twirling sun was seen to plunge toward the earth, emitting a considerable amount of heat (enough to dry the clothing earlier soaked in the rain). Before the disc hit the ground, it stopped and flew away (a behavior that later prompted those interested in UFOs to compare it with a flying saucer). The next day, newspapers across the country carried the story of what occurred. Several years after the events, two of the children passed away. They had been told that the Lady would come for them in a short time. The focus for many years was then on Lucia, who lived until 2005. She spent more than seventy years as a Carmelite nun, then passed away just a few weeks before Pope John Paul II, whohad put full papal authority behind the apparitions with a series of activities. He initially visited Fatima (as had Pope Paul VI) and then, in response to the message of Fatima, consecrated Russia to the virgin. On May 13, 2000, he canonized the two deceased visionaries, Francisco and Jacinta. Pope John Paul II’s interest in Fatima was greatly stimulated by an event that occurred on the anniversary of the first apparition in 1981. In the middle of a crowd, he bent to kiss a picture of the virgin carried by a pious believer. As he did so, a bullet whizzed over his head. Had he not responded to the picture, he would have been killed. The basic message at Fatima called for increased devotion to the rosary and the Immaculate Heart of Mary. However, during the July apparition, a longer secret message was given to the children. This secret message would become the focus of much interest in Fatima. The secret message was in three parts. Lucia committed the secret message to paper in the 1940s, but only the first two parts were revealed. These parts included a vision of hell and the need for further devotion to the sacred Heart. The third part of the message was put in an envelope and sent to the Vatican. It was known that both Pope John XXIII and Paul VI were made privy to the Third Secret and decided not to reveal it. In 2000 John Paul II released the text of the third secret, seemingly doing so before Lucia died, so she could verify its authenticity. Part of the message dealt with an assassination attempt of a “Bishop in white.” Many believed it to be a prophecy of the 1981 attempted assassination of John Paul. The revelation of the secret message noticeably slowed much of the wild speculation that had built up over the preceding years, especially in fringe Marian groups. Cirrincione, Joseph A., with Thomas Nelson. The Forgotten Secret of Fatima and the Silent Apostolate. Rockford, IL: Tan Books, 1988. Kondor, Louis. Fatima in Lucia’s Own Words. Fatima, Portugal: Postulation Centre, 1989. Robertson, Timothy Tindal. 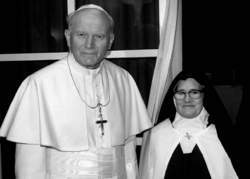 Fatima, Russia and Pope John Paul II. Still River, MA: Ravengate Press, 1992. Ryan, Finbar Patrick. Our Lady of Fatima. Dublin: Browne and Nolan, 1944. Walsh, William Thomas. Our Lady of Fatima. New York: Image Books, 1954. Born circa 605 in Mecca; died 633 or 632 in Medina. Daughter of the prophet Muhammad. The Shiite imams and many Muslim dynasties, including the Idrisids, Fatimids, and the Saadi and Filali sharifs of Morocco, traced their ancestry to Fatima and her husband, Muhammad’s cousin, the caliph Ali. When Fatima finally finishes secondary education, she strikes a deal with her mother on how she will finance her tertiary education, knowing full well that her father is against it, and will never support her. As a result of these apparitions, Mary was given the title Our Lady of Fatima and the site became a major center of Marian pilgrimage. Kusztra further pointed out that Shaikha Fatima cares a lot about children, because she believes women and children are the future for the family, and that she has worked for the family to become solid, harmonious and integrated, considering this as the key to the success of all community institutions, whether social, educational, religious or environmental. Fatima Bibi was married to Haider Zaman for 15 years and they had four children. In the late 1940s, the first school classes at Fatima were taught by Mme Desbiens in Adelard Chevrefils' home. My Flower Basket: Mohamed Jassim Mohamed, Fatima Abdul Mahdi Al Jaboori, Hala Rakan Al Zayani, Muneera Ahmed Rashdan, Latifa Taha, Shaikha Jassim Bucheery, Mayar Maher Khalil and Fatima Daif Al Bana. Fatima was given a suspended prison sentence in January 2014 after she posed a prospective bride on a match-making website. The 16-year-old Fatima Saud Al Mualla, donated the proceeds of her best-selling book, "The Hidden", to Friends Of Cancer Patients Association (FoCPA). Seeking to step into the gap and provide children with an education, Syrian refugee and former teacher Fatima has transformed her tent into a school. com)-- New York City-based Echo Park Films recently announced its plans to produce a feature film based on the events surrounding the 1917 appearance of the Virgin Mary to three shepherd children in Fatima, Portugal. ABU DHABI, March 25 (KUNA) -- Kuwait's Minister of Social Affairs and Labor and Minister of State for Development and Planning Affairs Hind Al-Sabeeh praised efforts exerted by Sheikh Fatima Bint Mubarak Al-Ketbi -- spouse of the late founder of the UAE -- in supporting family programs and women activities in various Arab nations.